Several artistic-minded local congregants have created religious-themed works -- and where better to display them than their respective places of worship? And what better time of the year to view them? Donnalee Dunne's oil paintings of orbital images of Earth are displayed on each side of the altar at The Oneness Center in northeast Fresno. Another Dunne painting hangs in the center's lobby. And Dorothy Ralph Gager's sculptures of the Stations of the Cross are mounted on rock piles along a garden pathway next to St. James' Anglican Cathedral in east-central Fresno. "It makes a person well-rounded when they can be exposed to the arts," says Dave Friesen, who organizes the artwork at North Fresno Mennonite Brethren Church. "When we feel God gives us gifts, we feel it's important to have a place to display them." A year ago, The Oneness Center held an exhibit featuring the artwork of Dunne, an attendee and a part-time art and design instructor at California State University, Fresno. The exhibit, "Quintessence: Portrait of Earth," was a big hit, says the center's minister, the Rev. Janette M. Freeman -- so much of a hit that The Oneness Center bought two of Dunne's paintings and displayed them in the sanctuary. 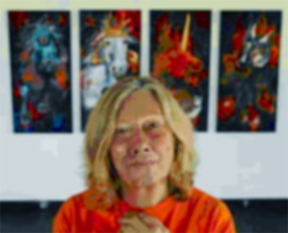 Dunne says she received inspiration to do the paintings "Orbital 1" and "Orbital 2" from satellite images of Earth that she studied for a master's degree in computer art and painting at Fresno State around 2000. The paintings are dominated by splashes of red, yellow and orange, and feature rectangles and fabrics that create texture. Dunne says her goal is to create "illusions, moods and atmospheres" in her work. "I wanted to paint a portrait of Earth, different aspects from the physical to what is considered inside, the magma and all," she says. "It's an overview of what the Earth is going through. We are here just a short time, yet the Earth is alive, it's pulsating, and it's vibrant. "We are but a small part of the whole universe. It's just a vast spiritual connection. It's connected by energy, by magnetism. We may not be able to paint the things we can't see, but we can feel them." 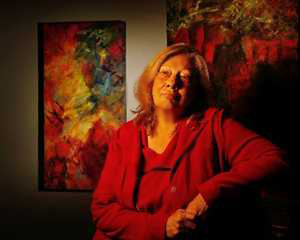 Freeman says Dunne's paintings help visitors at The Oneness Center to experience a spiritual connection. "Everything speaks to how life flows -- one life in the middle of everything," Freeman says. "The universe is connected. It speaks to oneness, life, energy and movement. Her work is very spiritual." Donnalee Dunne's "Soft Geometry" exhibit is a contrast in itself. The "InnerCity" acrylic series on one wall are forceful abstracts of architectural-inspired lines and vertical skyscraper shapes, cast in urban grays and blues and yellowish ochres. Though the colors are subdued, the scenes brim with power from thick stroke work. Across the way is an "SG" (Soft Geometry) series that jars the eye with bold reds and pinks and purples in mostly sharp lines and angles that make your eye zip here and there, in and out ... it is geometry in relishable proportions. Dunne is a painter and familiar figure on the local arts scene who works in traditional and digital media. The Gallery 25 Web site, which shows some of her vividly colored creations, states: "Her colorful abstracts and alternative landscapes, printed on Habotai silk, are inspired by the Sierra Nevada and other California settings where she lives." Donnalee Dunne and other Gallery 25 members exhibited artwork at the United Arab Emirates Benefit for Strays of Abu Dhabi. There was a charity ball art auction on April 10 at the 5 star Millenium Hotel in Abu Dhabi, which included dignitaries and a well known live jazz band. The art auction consisted of 51 international works with an animal theme (16 from Abu Dhabi and 35 from the USA). Jim & I have had some wonderful comments, and some sales of the art. It is a good combination of shows. I would like to invite you to attend the 'conversation with the artist' I am getting together for Saturday afternoon. It is the first day of spring and I have planned to celebrate this event for over a year now - my Ode to Joy in the gallery on Primavera! In Donnalee Dunne’s “Ode to Joy” at Gallery 25, color doesn’t just dominate. It explodes. If we think of spring as a re-introduction of color into a barren, wintery landscape, then Dunne’s show is like a big party welcoming the season. Lush purples, piercing greens, brilliant yellows – it’s like a cross between a botanical garden and an extravagant collection of tropical fish. I especially like the organic textures and shapes of Dunne’s mixed-media pieces, which give the exhibition a junglelike density. For a moment, you’re lost in a world of color. "Alchemy" at Gallery 25 is an art exhibit that spotlights work by 29 members, many of whom are well known in the Fresno-area arts community. Donnalee Dunne, whose oil painting "Apocalypse" is in the show, curated the exhibition. "To me, it's a milestone," says Dunne, who teaches graphic design and computer art at California State University, Fresno. "It's cohesive. It has depth. It has meaning. It has context. ... With the high caliber of artists in this group, we all knew we would come up with something elegant, deep and beautiful." Dunne's "Apocalypse" is a four-panel piece that harkens to the Four Horsemen of the Apocalypse but focuses only on the horses. Each animal, in closeup, looks possessed or strikes an intimidating pose as bright blood reds and orange hues vibrate through each panel. One horse has a great horn thrusting from his forehead. Another wears a vikinglike headpiece while his chest cavity is exposed. The piece reflects Dunne's many interests, including history and the work of other artists, such as Francisco Goya's gory "Saturn Devouring His Son." I also dropped in at Ashtree Studios, where the work of seven women artists -- including co-owner Aileen Imperatrice -- are on exhibit. The others are Sandy Schulte-Day, Donnalee Dunne, Anne Fraker, Jamie Meadows, Christina Motta and Pat Chimenti. Imperatrice says she invited artists who she knew and had recently come to know. And, it just so happens, each artist brought pieces that could be part of a series, which gives the show a more cohesive feel. Imperatrice, for instance, has three paintings of chairs, which she has become known. Each reflects an emotional experience. Dunne, who produced dramatic expressionistic paintings of apocalyptic horses at a recent show in Fresno, in this installation returns to nature: These are still life paintings of fruit. But, what enhances these images is her use of stripped bed linens glued to the canvas. By painting on this material, the fruits' texture and appeal come through more vividly.